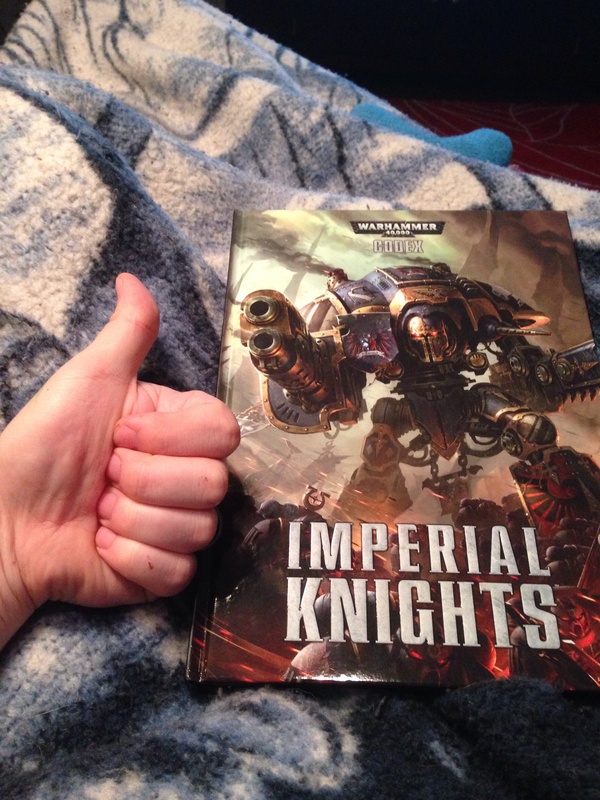 Last weekend I picked up my copy of the latest codex from Games Workshop, Codex: Imperial Knights. This review is more about the story and general impression of the army than a thorough analysis of the competitiveness and viability of this book. This is the first completely new army GW has released in about 10 years and it has the potential to change the face of the 40k universe. When I first heard about the Imperial Knights I was very excited to not only see the new models, which are stunning, but also to read the new fluff and story. The book starts out with a great story of a noble knight pilot being hooked up to his knight suit and reestablishing the synaptic connections with this engine of war. This story and the other stories peppered throughout the codex establish a new and distinct culture within the 40k universe that still fits into the grimdark future we’ve come to love. The fluff section of the book also mentions three classes of knight suits beyond the Errant and Paladin which we already have–the Crusader, Castellum, and Lancer pattern knights. These references coupled with the fact that the book refers to the unit entries as datasheets leads me to believe that GW or Forge World may release other patterns of knights later or different weapon options for the knights to use. The new digital dataslates and weekly release schedule give them the ability to bring such things out later, although I so wish there were a few more options at launch. Although the rules don’t allow for Chaos players to bring along Knight detachments, it does mention knightly houses falling to Chaos and fighting on the side of the traitor legions during the Horus Heresy. This leaves some hope for us Chaos players, but the book says Chaos knights are rare. Ultimately I wouldn’t have a problem with a Chaos player bringing a knight in a friendly game as it is in the fluff. The codex also full of background on various knightly houses while still leaving the door open for you to creat your own knightly house or freeblade knights. It also conveniently includes all of the rules necessary to use a super heavy walker in a game, so you don’t need the Escalation or Apocalypse books to bring an Imperial Knight army. Overall, I found this book to have great story and background, but I would have liked there to be a little bit more in options for the army; a list of 4 or 5 pieces of wargear such as Space Marine chapter relics or Tau signature systems would have been easy to include without requiring specific modeling options and allow more diversity of army lists. The limited options leave me with the feeling that ultimately you will generally see knights on the table alongside allies to fill out extra points and take roles the knights won’t be able to fill. I give this book 3.5 stars out 5. I would like to mention that the models for the Imperial Knights are a solid 4.5 stars out of 5 for me (beautiful models, but I would like a little more flexibility to posing the legs) but I would have liked to see a little more in the book. I am having fun building my new knights and can’t wait to try them out on the tabletop. Time to stack some cargo with Riff Raff!